Riding Accessories for Genesis for use in Das Studio 4. Back Protector plus Riding Crop, Winners Rosettes and Gold & Silver Cups - with and without handles. Nice, but is it possible to get a .obj version of the ribbons and pokals . warmblood (6 years ago) Inappropriate? I really, really NEEDED these rosettes. Thank you! hamoni (6 years ago) Inappropriate? No difference marcoio - I now have a program which should tell me if something is missing from the file and it kept saying that things should be in one folder that I actually had in another, and I couldn't figure out what should have been where in the end, so I put both folders in just in case. 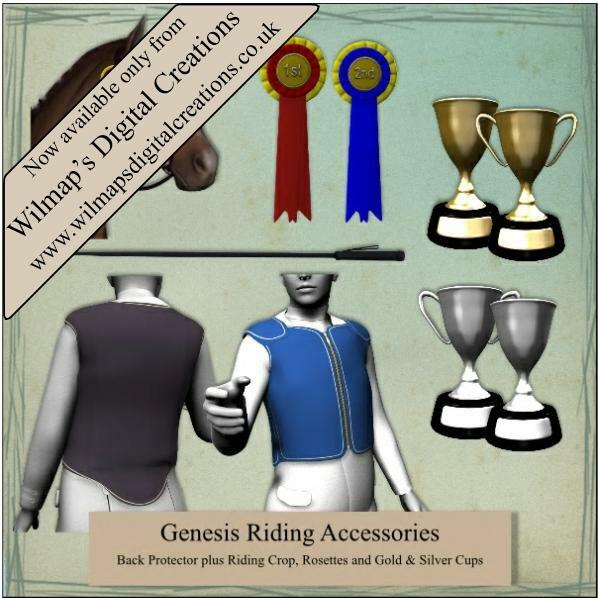 I noticed that some item are duplicated: in Genesis Riding Accessories folder and in Pusey Design folder: what's the difference? Wonderful addition, Thank You very much! JimmyC (6 years ago) Inappropriate? Thank you for these, they look great, just what was needed to finish off the set.